Remove or leave Film on LCD + Digitizer? Do I have to remove this one or not? Yes you must remove it or the screen won't work. I experienced this with a new iPhone 6 screen where the apple logo just kept flashing and would not respond to a reset via iTunes. Such a simple oversight which cost me hours of unnecessary work!! Yes, remove this protective plastic sheet right before you install the Front Screen. Often there is a tab to help remove it like in your photo. 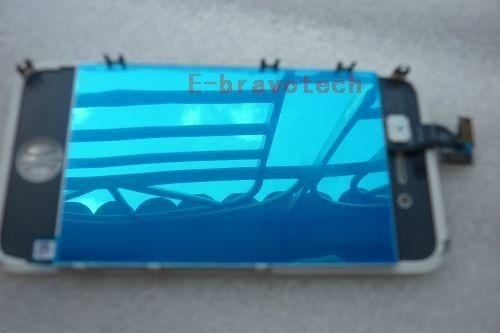 Some Screens don't have the tab on the plastic, but you still remove the plastic sheet. Or is that something else? Please answer the query of Mittchel. Does not removing the back film cause any problems? Before assembling, I hooked up my new screen to test it. The film was still on the back and it worked fine. Digitizer fine too. But remember the phone can get pretty hot in the sun so it is probably best to remove the film so it doesnt melt inside the phone. I believe the film is even put there so that debris doesnt stick to the metal foil berore it is installed. That way it can conduct heat away better. I'm just guessing about that though. Oh BTW this was an iphone 4.